Earlier this week I was back in Ottawa at Canada’s National Spider collection with a couple of enthusiastic students from the lab. We were doing more databasing, which involves reading old labels and entering the information into a database. 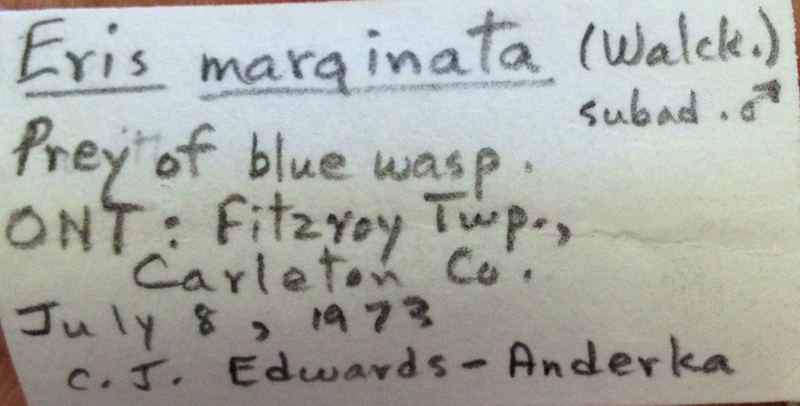 Yes, that label for a jumping spider species provides more than a name, locality and date. It provides a story. It confirms that spiders are hosts for parasitoid wasps, and it documents an ecological interaction; one that is stamped in time and place. Yes, more evidence of one spider species preying upon another species. Intraguild predation, recorded and placed in a vial. Planes, automobiles, and boats. (um, boats in Saskatchewan! A Province of relatively limited water, by Canadian standards). Label data provide opportunity to discuss, imagine and be inspired by biodiversity. 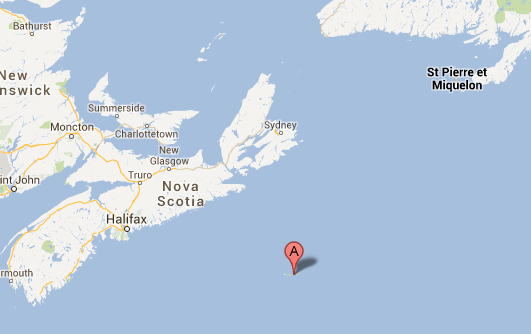 I identified a species of jumping spider from a place called Sable Island. The species is one of the most attractive spiders in North America, Habronattus decorus. So… the questions start. How did it get there? Presumably ballooning? Are these lovely critters still on Sable Island? What is the fauna of Sable Island? Is is a stable fauna? An old vial, stuck in a cabinet in Ottawa, opens to door to questions of dispersal, biogeography and biodiversity. I think the message is clear: databasing provides a rich opportunity to paint a picture of a species, over time and over space. But here’s the problem: there are about 2700 vials of jumping spiders to database. Each one takes about 3 minutes to database, meaning it would take about 135 hours of work to database only 1 family of spiders, in one collection! And working in the collection is not free – paying students, travel time, lodging, etc. all take time and resources. So far our laboratory got through about 400 specimens (15% of the Salticidae). We have barely made a dent. This is an undeniable problem: We must capture these data and make them available for scientists to use. How can we understand biodiversity change when most of our historical data are not yet digitized? How can we begin to understand biodiversity patterns without knowing what is where, and when? When I wrote my previous post about the Canadian collection, I was pointed to Notes from Nature – an on-line resource where databasing is crowdsourced. 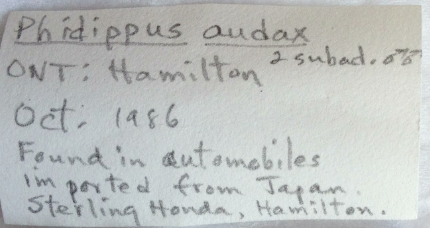 This is a pretty neat idea – label data (and specimens) are photographed, uploaded to the site, and anyone in the world can transcribe the data. It allows anyone with an interest in biodiversity to reach into a collection and learn the stories from the specimens. Question: would YOU help database if you could go on-line and see these kinds of images? Does it grab your attention? 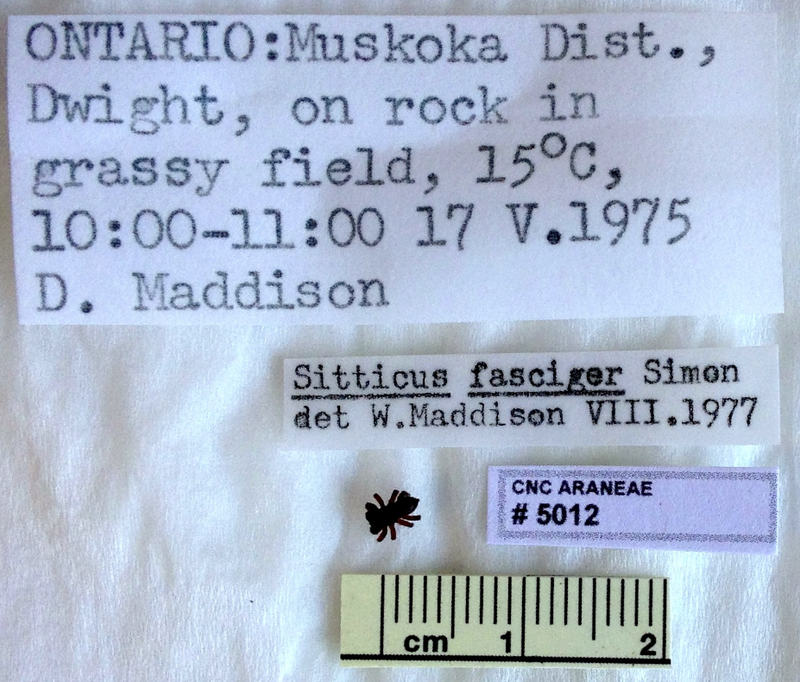 Even if 20-30 people agreed to database 75 or so specimens, each, the Salticidae would be done! (and, of course, someone would have to take images, and edit them beforehand). I am keen to have your feedback…. I want to know if it’s an idea worth pursuing. Do you want to learn stories from specimens? We’re fairly lucky in the world of bird research, since the smaller vertebrate collections (usually birds and mammals) are often the first to get digitised. And there are projects like Ornis (http://www.ornisnet.org/) that bring together museum databases across multiple institutions. I’d certainly spend a few hours on the weekend transcribing data. 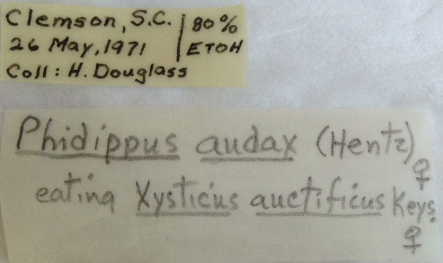 I digitized the Acadia herbarium specimens two summers ago & can relate to the labels telling stories. As a plant ecologist, I’d love to peek into the collections of other taxa & I think projects like Notes from Nature make for interesting citizen science collaborations. Thanks for the comments! 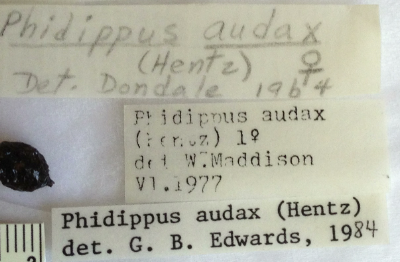 Glad there are lots of other keen biologists out there who appreciate, treasure and enjoy museum/collection data. Ever specimen is like a little present; a little puzzle. A test of geography & handwriting. What a fun article! There may be a way for you to photograph much faster. Consider my lesson learned. We would have groups of children visit the UT insect collection to work on spiders. I took one group of kids, and someone else took another. The goal was to transfer specimens from leaky plastic vials to glass vials and to divide specimens among multiple vials if they were noticeably different, duplicating labels as necessary. (These were all from pitfall traps, so the labels were pretty much all the same except for date and trap number.) By the time we finished one tray, the other group had finished three trays. The difference: they had set themselves up in an assembly line, so that no one ever had to transition between tasks, arranging it so that faster tasks preceded slower tasks. The cumulative time for the effort was the minimum time required for the collection as a whole rather than per vial. Great post. 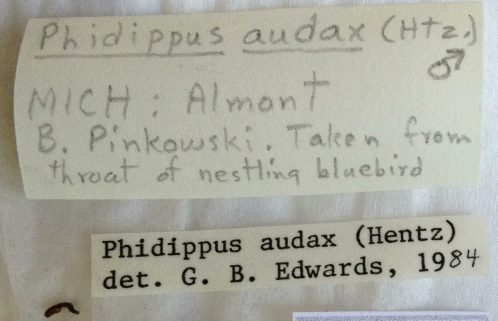 I data based some of the specimens at the UofA Strickland Museum and at the Northern Forestry Centre. It was a lot of fun (especially for a history buff like me) to go through that old information. The Criddle label is neat, I wonder if that is how he spelled the name of his homestead? In most literature it’s listed as ‘Aweme’. oh, and this loyal Roughrider fan would be remiss if he didn’t point out: Saskatchewan is ~10% water by surface area; the province’s name means ‘Swiftly flowing river’ in Cree; Saskatoon even has it’s own shipwreck: http://www.theglobeandmail.com/news/national/shipwreck-from-1908-found-in-south-saskatchewan-river/article5356495/ and the province was the site of a naval battle: https://en.wikipedia.org/wiki/Battle_of_Batoche. So finding a spider on a boat isn’t THAT surprising to this flat-lander. -interesting point about the Criddle label. Maybe a typo? Curious. HA – I knew a Roughrider fan would comment on my ‘lack of boats’ comment in SK. Hee hee. And I did not know about that shipwreck. Very cool.